Today we had a full gym. 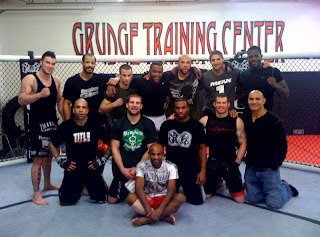 We had Rashad Evans, Shane Carwin (not in picture), Brendan Schaub, Coachs Phil Nurse, VanArsdale and T, Chaun Simms, Demico Rogers, Jeremiah Constant, Gerald Harris, Christian Allen, Cody Donovan, Brandon Thatch, Eliot Marshall, Alvin Robinson, Tyler Toner and many others. Kru Nurse worked with me afterward and showed me some cool tricks!